If you're interested in losing weight and keeping track of the trends and headlines in popular nutrition, you might have heard that sodium is bad for you if you're trying to lose weight. This is partially true, because the sodium in your diet can cause you to gain water weight, but doesn't have any direct bearing on your ability to lose fat. Sodium is an essential mineral that, despite its bad reputation with regard to health, you need in order to maintain cellular function. According to Dr. Lauralee Sherwood in her book "Human Physiology," sodium helps maintain fluid balance in the body. Furthermore, you need sodium in order to move certain molecules -- like sugar -- into the bloodstream, and you also use the mineral for cell-to-cell communication. Most Americans, however, aren't sodium deficient, so you don't need to supplement as you often do with other minerals. While it's common to refer to having weight loss goals, most people mean they want to lose body fat -- as opposed to losing muscle or water -- when they say they want to lose weight. To lose body fat, you have to take in fewer calories than you expend each day, which is best achieved through eating fewer calories or expending more through increased physical activity. Eating a healthy, reduced-calorie diet and exercising helps prevent muscle loss during the period of fat loss. Eating lots of sodium can keep the numbers on your scale from going down as fast as you'd like while your dieting -- and sometimes can even cause your weight to go up. Sodium has no bearing on fat weight, however; the weight you gain or fail to lose as a result of sodium consumption is water weight. This is because sodium consumption causes you to retain more fluid in your bloodstream and in the spaces outside the cells, increasing your blood pressure. While this isn't healthy for your heart, explains the American Heart Association, it isn't the same thing as having too much body fat. 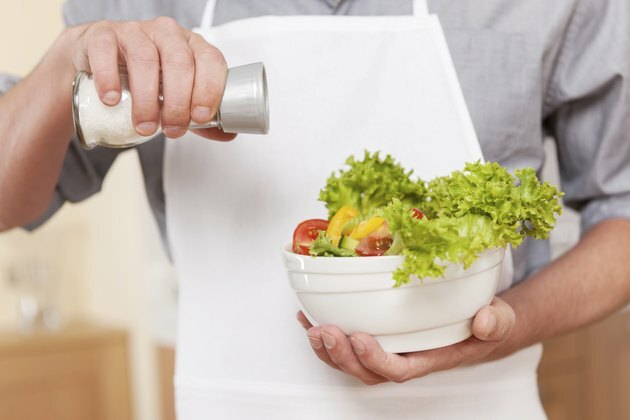 Generally speaking, while sodium won't thwart your weight loss plans -- at least not in any real sense, as you'll easily lose the excess water when your sodium consumption drops -- too much sodium isn't healthy. Furthermore, foods high in sodium, including processed foods, are often high in unhealthy fats and calories as well, which will prevent you from losing body fat as fast as you'd like. Avoiding large quantities of sodium is a good idea for health, even if it's not critical to your weight loss diet. Try to limit your intake to 1,500 milligrams daily to support good health.